Check the outdoors. Make sure all storm drains, gutters, pipe vents, and downspouts are cleared of debris to prevent unwanted water from leaking into the home. Also check the flow of all outdoor faucets to monitor for drips. Faucet drips may indicate cracks that can cause leaks. Complete a sump pump test. Pour a gallon of water into the sump pump pit. The sump pump should activate and push the excess water out through the drain pipe. If your sump pump is not working, enlist the help of a plumbing expert. Tune-up your kitchen sink. 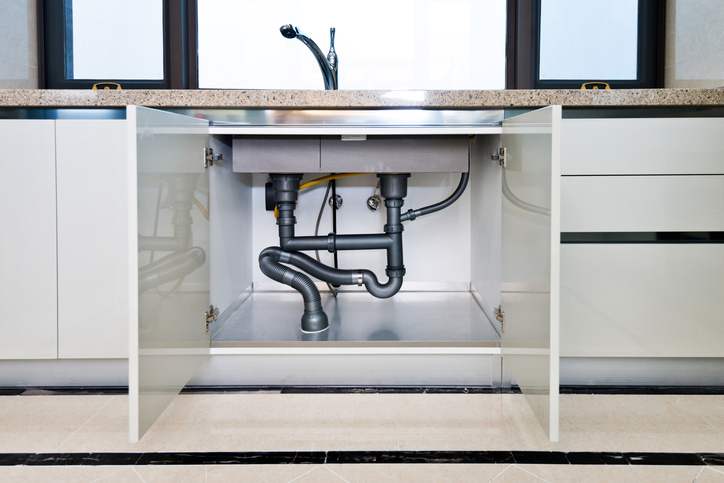 Check the pipes underneath the sink for leaks then run hot water down the drain for 15 minutes to clean out the drain. Also, check to see how the sink is draining. For garbage disposal maintenance, throw ice in the disposal and run cold water through to clean the blades. Perform a bathroom check. Remove shower heads and let them soak in a vinegar bath for an hour to remove any sediment. Open the toilet tank and flush to check the mechanism and make sure each part is functioning properly. Monitor the refill valve and make the tank refills within one minute. Check your toilet bowl for cracks or leaks. If you suspect a leak, add food coloring to the toilet tank and wait 30 minutes to flush. If the coloring appears in the toilet bowl, the tank is leaking into the bowl. Monitor for invisible leaks. Find the main shut off valve and turn off your water. Check your water meter leak indicator for any water movement.